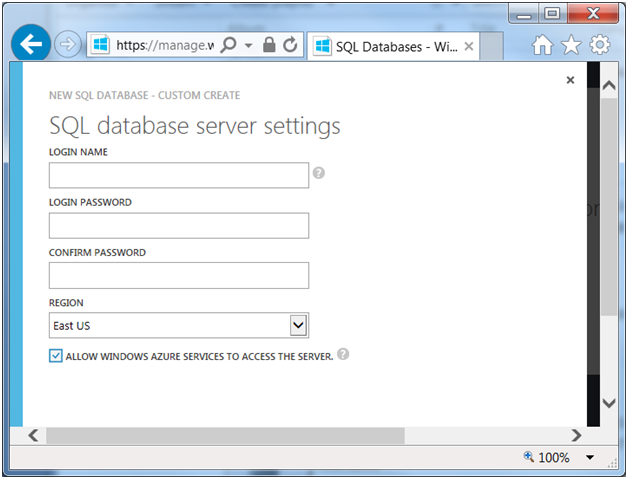 Today we are specifically going to focus on SQL Databases component within the Windows Azure Management Portal. 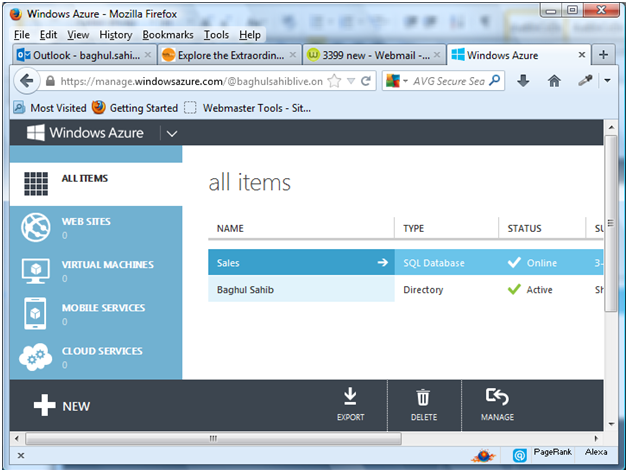 We have already provision a Web edition SQL Database with Windows Azure services. 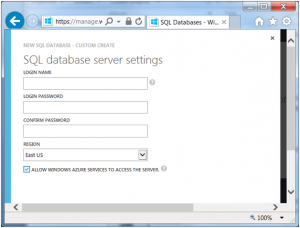 Please review our other blogs posts on how to deploy SQL Database with Windows Azure. 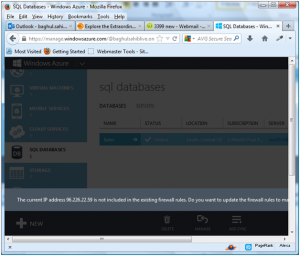 Next we would like to manage our SQL Database that’s available under the Windows Azure subscription. 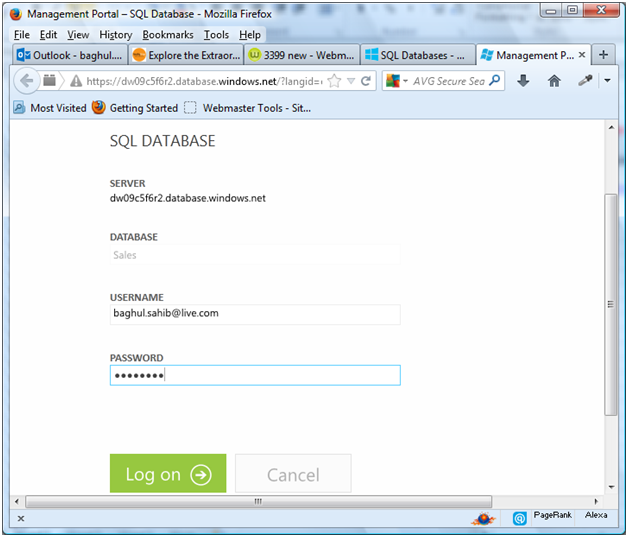 For this click on SQL Databases in the left navigation bar. You will see two tabs in the right pane, one highlights the databases, the other one servers. Next click on Manage button available in the bottom middle. When we did that we got the following message. This basically means that our current IP address is not included in the Firewall Rules, rules that are setup to control access to our data. My frens, that is a good thing! Click on Yes. If you get a Pop-up message, add Microsoft.com to the acceptable sites. After we enter the correct info, we are finally at the SQL Database administration level. In this blog post, we are not going to cover the details of DB Administration. We have existing blog post and plan on writing about new functionality. Here is what it looks like on our computer monitor. Now you are at the database level. 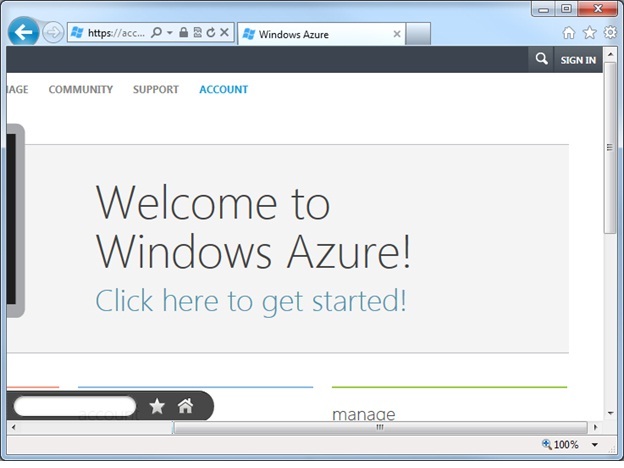 In this tutorial video on Windows Azure SQL Databases , we cover Microsoft Windows Azure signup process. 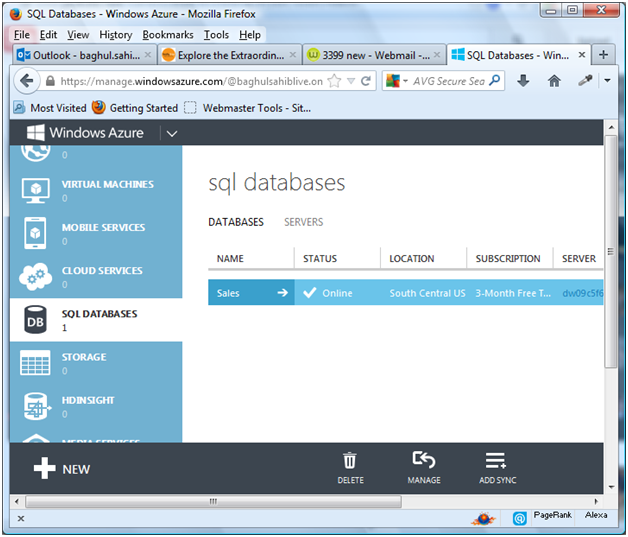 Windows Azure SQL Databases is a cloud based relational database built on SQL server technologies. 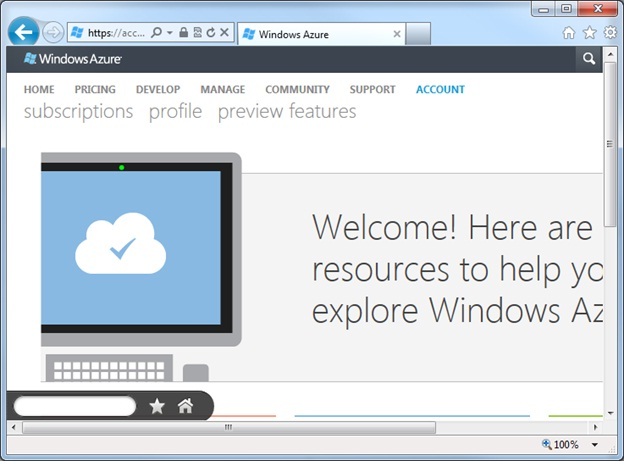 It is a scalable, self managing and highly available database service hosted by Microsoft in the cloud. 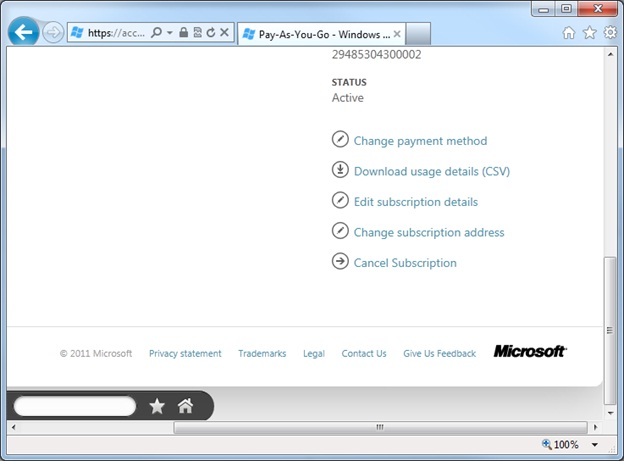 You can either sign up on the Windows Azure Platform website or the Microsoft online services customer portal. 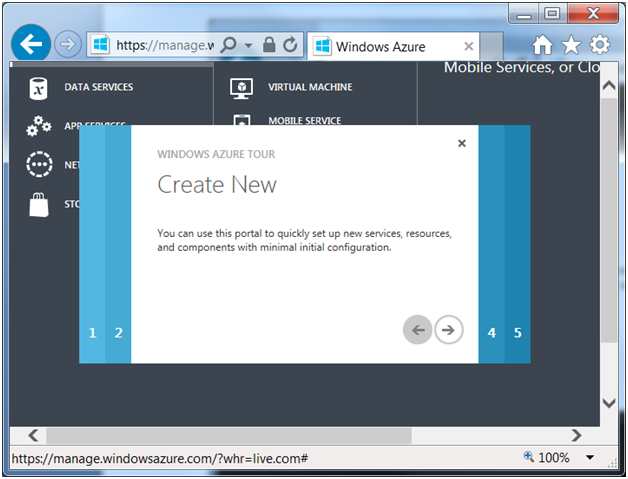 For our demo on Windows Azure SQL Databases, we go ahead and sign into our Live account and select Windows Azure Platform Introductory Special. In this training demo on Windows Azure SQL Databases, we also cover some of the background information regarding pricing and features. 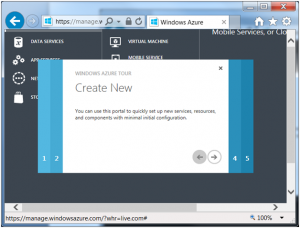 We go ahead and create a SQL Azure server, setup administration username and password account and then walk you through rest of the setup process. 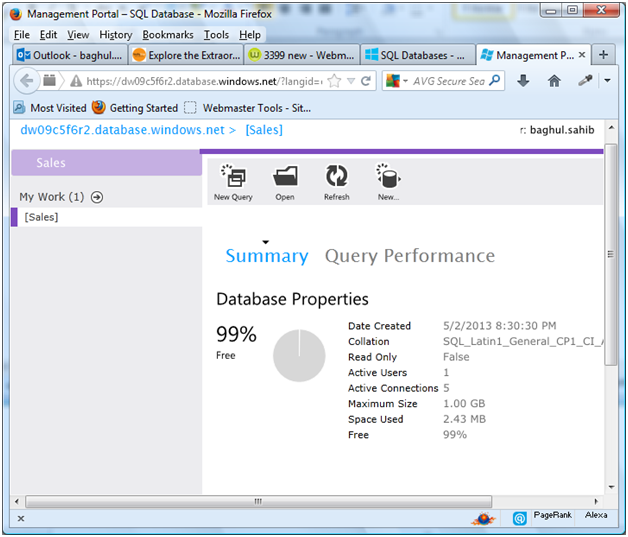 There is quite a bit of resources on Windows Azure SQL Database. However these websites and resources are not listed in one single location. 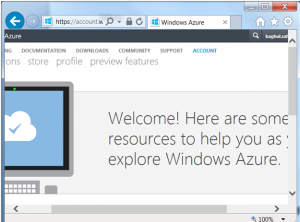 I figured we should have a short list of vital websites you need to know about when it comes to Windows Azure SQL Database. 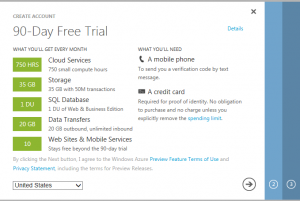 How to manage your Windows Azure subscription? 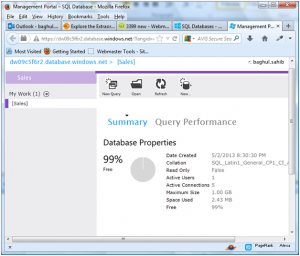 Using stored procedures in Windows Azure SQL database is a conventional wisdom. Store procedures typically run faster than Adhoc SQL statements. The reason for this is that they are pre-compiled and SQL Server has generally a good idea about the execution plan it needs to take. Another advantage is that with stored procedures, you can use input and output parameters. You can call one store procedure from within another procedure. One of biggest benefit of using stored procs is code reuse, the concept you build it once and use it over and over again maybe from different application or interfaces. The Transact or TSQL code within the store procedure will run together as a unit and is typically used to do certain tasks like outputting a certain report, returning some sort of value back to the client application or at the very least execute a collection of SQL statements together as a batch. 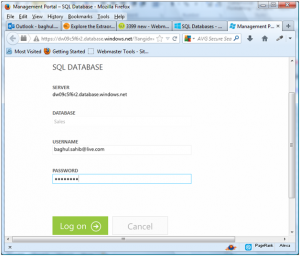 We are going to show you a simple example of using stored procedure utilizing Windows Azure SQL database. In terms of low cost structure for cloud database service , Microsoft SQL Azure is already a viable option. However there seem to be two issues with their cost structure. One was for databases that are smaller in size between range of 50 – 100 MB in size. The other issue was with VLDB that are greater than 150 GB in size. With their new pricing structure introduced last year, they are addressing both these issues. In addition there is a significant reduction in price for other cloud databases as well. The table below goes over in detail the database size, before and after pricing structure and the percentage decrees from the original cloud database price plan. Complete information on SQL Azure Cloud database can be found at Sql Azure Training page. 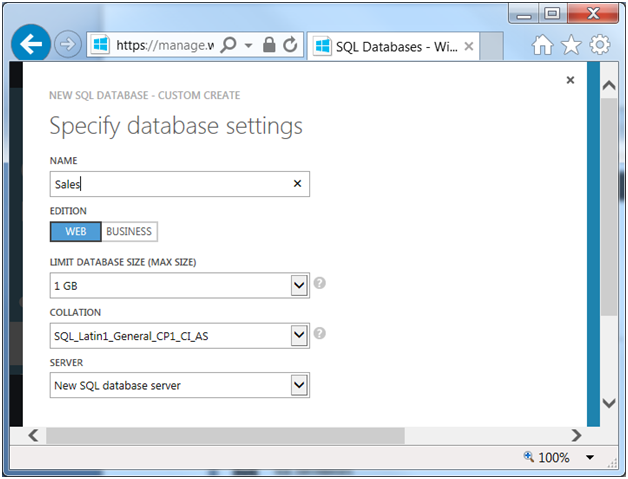 You can create a database in SQL Azure with the CREATE DATABASE command. One item to note is the missing key clause ON PRIMARY. In addition notice you do not need to define the Data and Log file info as you typically do in an On-Premise SQL Server. These are taken care of by Microsoft Cloud services. 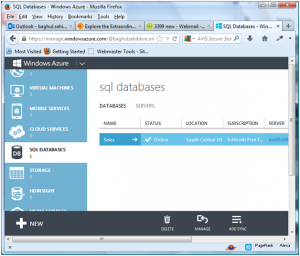 You can create a table in SQL Azure with the CREATE TABLE command. Please note the missing key clause ON PRIMARY, we have included the error we received below. 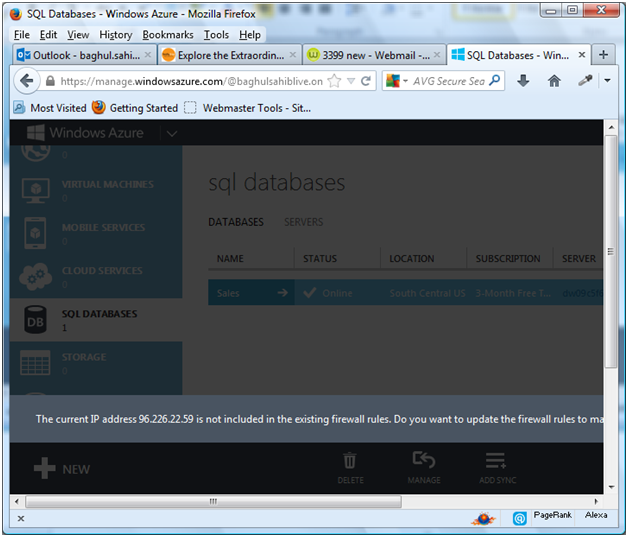 Another fact is that you cannot specify the “USE” clause in SQL Azure. 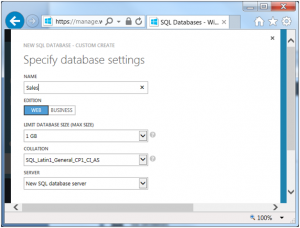 You have to open a session with a specific database and then execute the SQL code. We create a simple stored procedure here that we pass in two parameters, city and country. It then runs a select statement on customers table. 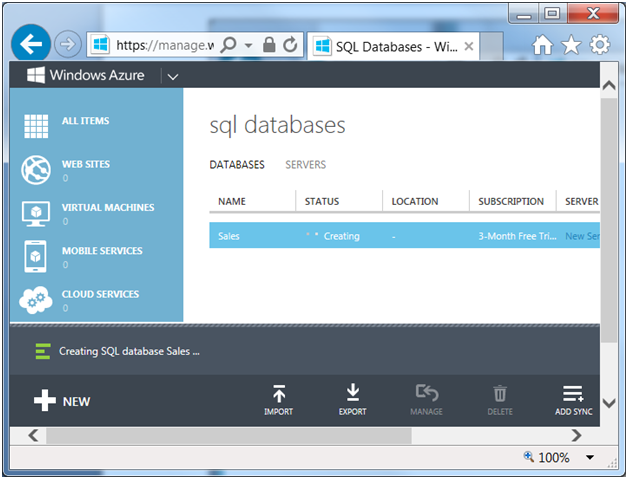 SQL Azure is Microsoft’s version of Cloud Database. 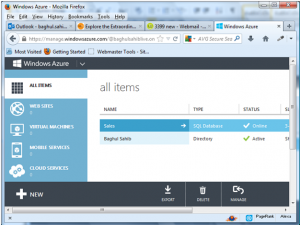 SQL Data Services are now known as Microsoft SQL Azure and SQL Azure Database. There are a few changes, but fundamentally Microsoft’s plans to extend SQL server capabilities in cloud as web-based services remains the same. SQL Azure will continue to deliver set of services for relational databases. The reporting, analytics and data synchronization with end-users remains unchanged. This makes it most appealing to current users of SQL Server. Sign in with your Live ID Account. Next click on “Subscriptions”. 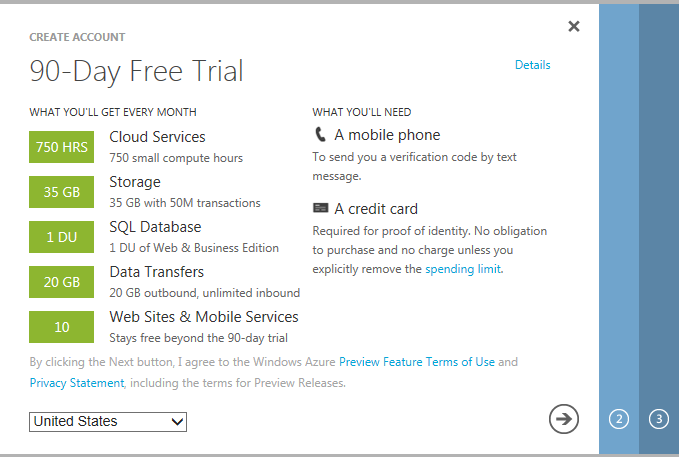 Select the Azure subscription which you would like to cancel. 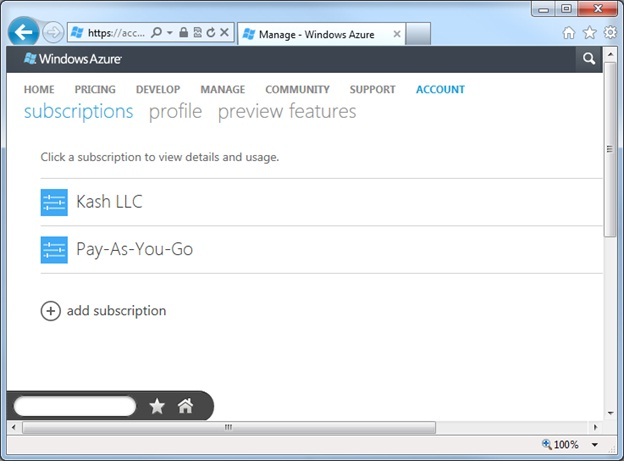 In our case we are going to choose Pay-As-You-Go Azure subscription. This is what we see on our computer screen. Scroll all the way to the bottom right side of the page. 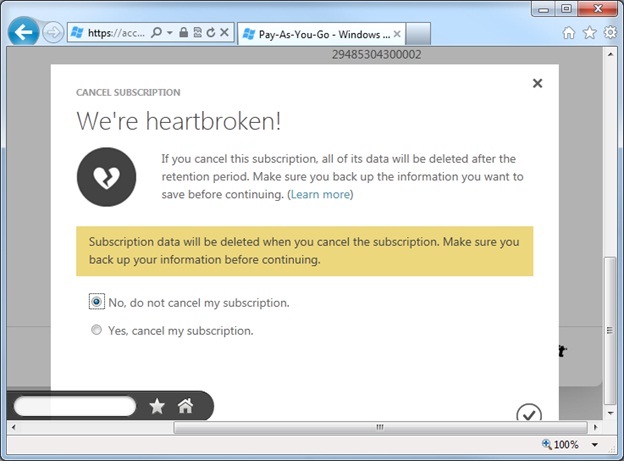 Go ahead and click on “Cancel Subscription”. We have included a screen capture for you. This will take you to a new screen. Love the “Hearbroken” message . Select “yes, cancel my subscription” option. Click on the tick mark to complete cancellation. Now it should take care of it. When it returns you to the Subscription page, you should see Azure subscription gone! 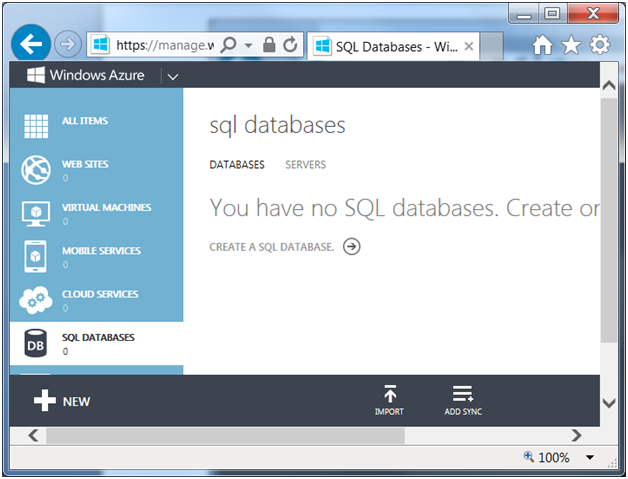 For more cloud database related topics, visit our main site on SQL Azure.